A movie that started out as a "tweener" project for star Jackie Chan, The Medallion (formerly known as Highbinders) is now the biggest-budget film to ever come out of Hong Kong. Currently over its $35 million budget by $6 million, The Medallion started filming in Dublin in July of 2001 (with a break taken in the middle so Chan could do The Tuxedo), and is currently shooting in Thailand, with additional location work planned for Hong Kong. The idea for the story comes from Chan's friend Alfred Cheung, who will have both writing and producing credit on the film. He describes it as a cross between Lethal Weapon and Ghost (though I actually suspect he may mean Ghostbusters), set in the world of smuggling. Associate producer Bey Logan told Reuters, "It's Jackie Chan-style realistic action and Hollywood special effects. Jackie wanted to do something in the same ballpark as he has been doing but take it to another level." There's no doubt the premise of the film is intriguing. 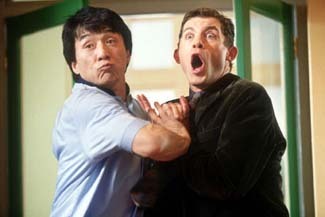 Set in the present day, Jackie Chan and British comedian Lee Evans (the "pizza dude" in There's Something About Mary) play two cops in Hong Kong, Eddie Yang and Arthur Watson (a bumbling Inspector Clouseau-type character), who are good friends and kind of an odd couple (much like Chan and his other recent co-stars Chris Tucker and Owen Wilson). In the days following the transfer of Hong Kong from Britain to China, Watson is assigned to Interpol, while the Hong Kong police put Eddie on the case of an international human-smuggling ring. After a number of violent incidents and deaths involving the smuggling trade, Interpol and the HK police partner the two to investigate Snakehead (Warlock's Julian Sands), the leader of the smuggling empire. The pair meets in Ireland to begin their investigation, but both men are quickly killed under mysterious circumstances while on duty. Miraculously, they come back as "Highbinders," and the battle between good and evil begins. Bey Logan describes the mythology behind the term highbinders: "A highbinder is someone who is killed and brought back to life with a special magic, in an enhanced version of what they were in life, good or evil. That's what happens to Jackie's character in the film. Highbinders historically were Chinese gangsters in New York and San Francisco. We wanted a specific name, and not something obvious like vampires or angels, so we settled on highbinders." In being resurrected, our two Highbinders become super-beings whose natural talents are enhanced. In the case of Eddie, he is able to leap over and climb buildings (in fact, one of Chan's highly-publicized stunts for this film involves an elaborate one where he actually climbs a building that is eight stories high). The film also features a rooftop chase sequence, which bears at least a surface resemblance to some of Yuen Woo-Ping's remarkable fight choreography in Crouching Tiger, Hidden Dragon and Iron Monkey. Though the film is chock-full of intricate Chan stunts, it goes much further than being just another action movie. Along with Evans, Chan is working with a wonderful ensemble cast and will get a chance to show his acting chops (much as he did in The Accidental Spy). Other players include Claire Forlani as another Interpol agent (and Chan's love interest), Christy Chung (Gen-Y Cops) and John Rhys-Davies (Raiders of the Lost Ark). Sharing directing duties on The Medallion are Gordon Chan (Fist of Legend), who is handling the dramatic sequences, and Sammo Hung, who takes on the action choreography. Hung and Jackie Chan have a friendship that goes back to the early 1960s, when they were youngsters studying acrobatics, martial arts, music and dance at the Peking Opera School. The two most recently worked together on the Hong Kong production Mr. Nice Guy in 1997, though Americans are probably most familiar with Hung through his starring role in the television series Martial Law. Of course, one of the perils of performing one's own stunts is risk of injury, and Chan did, in fact, wind up with a nasty gash on his face just a few days ago. He was apparently doing some hanging-wire work when one apparently broke and lashed him across the face between his nose and his left eye. Though the wound is minor, it is nasty enough that some of his close-up scenes will have to be delayed, but that really shouldn't cause any problems related to the film's release.